The name of Kanzeonji Temple appears in Manyo poetry and in "The Tale of Genji," a famous novel written by a court lady of the Heian period. 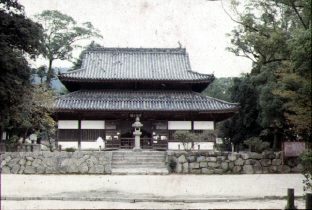 Kanzeonji was built in memory of the late Empress Saimei by her son, Emperor Tenji. 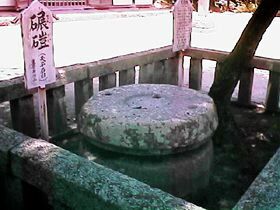 Empress Saimei, who died here in 661 while leading (at the age of 67!) an expeditionary force which intended to reassert Japanese claims to territories on the Korean peninsula. After its completion in 746 A.D., it became the most important Buddhist establishment in Kyushu, exerting a great influence on all other temples in the region. It was ravaged by fire again and again, and today it is less than a tenth of its former size. The main building dates back only to 1688, but all around it one can find foundation stones and similar mementoes of vanished glory. Now only a bronze Bonsho bell, which is the oldest one in Japan, and a number of Buddhist statuses survive to tell us of its history. This is a beautiful, though lonely spot. 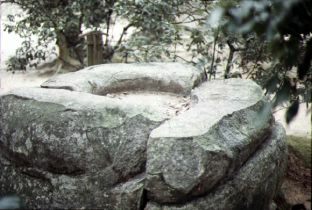 Kanzeonji was the most important ancient temple in kyushu. 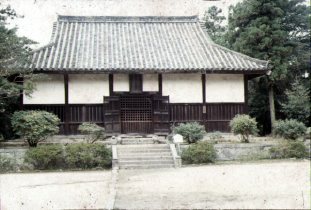 The temple was built in memory of late Empress Saimei by her son, Emperor Tenchi. After its completion in 746A.D., it became the most important Buddhist establishment in Kyushu, exerting a great influence on all other temples in the region.